Princess Cruises is offering five beautiful ships for South Pacific and Hawaii cruises in 2019. Enjoy a variety of Fiji cruises, Hawaii cruises, Tahiti and Hawaii cruises or a repositioning cruise through the South Pacific! CYBER SALES EVENT ON NOW! 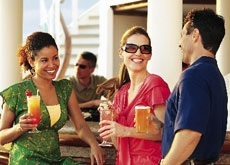 Dollars OFF, Pre-Paid Gratuities, Shipboard Spending Money & Upgrades! Immerse yourself in Polynesian culture with a Princess cruise to the South Pacific. Toted "Best Cruise Itineraries" seven years in a row by Recommend Magazine, why wouldn't you want to join Princess Cruises as they take you through the South Pacific islands? Enjoy the Hawaiian Islands and French Polynesia on a 28 night roundtrip Los Angeles cruise! Explore Hawaii, Tonga, Samoa, French Polynesia & New Zealand on a 35 nights roundtrip Sydney cruise! 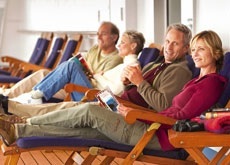 Cruising offers something for everyone from the very young to the young at heart. It's great for groups, celebrations, and meeting new people. Princess Cruises offers traditional onboard activities like culinary demonstrations, bingo, wine tasting and spa services as well as presentations where you learn about the culture, top sites of the ports you will be visiting, plus live entertainment. Only on Princess Cruises can you enjoy evenings spent watching the stars, with complimentary blankets. Meet friends for a small bite, wine by the glass and enjoy street performer-style entertainment in the Piazza. Or spend a few hours of tranquility on your stateroom balcony - a relaxing retreat to enjoy the sunset, sunrise or read a book. Eat. Whether you feel like a multi-course meal in a formal dining room or hand-tossed Naples-style pizza by the pool, Princess obliges your every mood. From elegant specialty restaurants to themed buffets on deck, the variety of venues and dining options is certain to satisfy no matter the time of day. Discover all of the dining options available. Just unpack and let us handle the rest. That's our goal as The Consummate Host - to make you feel content and comfortable starting the minute you set foot onboard. As cruise destination experts, our experience and meticulous planning have earned us "Best Itineraries" by Cruise Critic and Recommend Magazine. Cruise with us and you can be sure to experience the best of the South Pacific. Our primary goal is for you to come back new. That's why you'll find every detail - from the friendly stateroom steward who greets you by name to the comfortably elegant venues that range from lively to intimate - is designed with your relaxation in mind. We've been sailing for more than 40 years, and our officers and crew are intimately familiar with the ports you'll visit. But don't just take our word for it - we're continually being honored by the industry for our carefully planned itineraries, our spectacular ships, and the way we make everyone, of every age, feel relaxed and happy when they're with us. View our cruise awards. 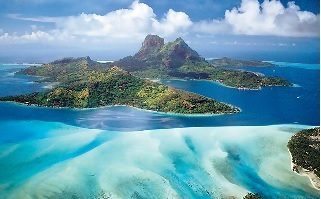 Experience the turquoise lagoons, velvet green valleys and 1,000-foot waterfalls of the South Pacific! Discover the intoxicating beauty of the Polynesian Islands. They are a paradise of five archipelagos comprised of lava-created islands and lush lagoons. Your ship sails from Papeete on the island of Tahiti - the island that inspired master artist Paul Gauguin - to Samoa, the Cook Islands or the Marquesas Islands, the most remote islands of French Polynesia. On every Princess Cruises itinerary, you visit the secluded beaches of Bora Bora, the pineapple plantations of Moorea and the sacred vanilla-scented land of Raiatea. Imagine spending your days horseback riding, shopping, or snorkeling, then returning to the luxury and comfort of your Princess ship. Princess ships are a destination all their own! It's afternoon in the Atrium - the central hub of your Princess ship. And much like the quaint city squares you'll visit ashore, the Piazza on Deck 5 is bustling - people are laughing and conversing over a latte or glass of wine as they enjoy a folklore performance nearby. The experience of your destination infuses every moment aboard. As you get to know each deck and every restaurant and lounge, you'll begin to feel more and more at home. 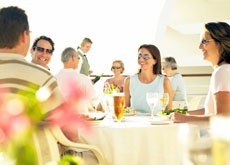 Returning to the ship each day, relaxing at dinner and sharing stories with fellow guests about your discoveries ashore, you'll find you life becoming richer in ways both large and small. Enrichment programs offered on board help bring the regions you visit to life with courses on art and architectural history, destination photography or scrap booking. Princess has been named Best Onboard Shopping for six straight years by readers of Porthole magazine. Visit the boutiques for island favorites or homegrown treasures like fine Italian leather, as well as commemorative 50th Anniversary gifts - all at substantial tax- and duty-free savings. Traditional English pub lunch features fish & chips, bangers and mash, British ales and other bonny bites. Main dining includes our trademark Anytime Dining - eat when and with whom you want - as well as classic Traditional Dining, at the same table with the same wait staff each evening. Delicious local influences make their way into special menu creations, served with flavorful regional wines, beers and cocktails. And don't forget daily-made Italian gelato for dessert on every cruise! Easy, convenient way to travel. Unpack once and experience the best of the region you are visiting in one cruise vacation. There is nothing easier than simply waking up in the morning in the world's most exciting and interesting cities. Unbeatable value. Your Tahiti cruise fare includes accommodations, dining, entertainment and an endless array of activities. Plus, you won't have to pay for costly airfare or ferries to get you from one island to the next. Warm, welcoming service. You'll be right at home without a care in the world. From sun-up to late into the night, we are there to anticipate your every need. And by voyage's end, our crew will feel just like family. Refreshing sea air. Sea days can be as relaxing or active as you wish. There is nothing comparable to being out on the open sea with warm South Pacific ocean breezes. Get Married in French Polynesia! Princess Cruises is the only cruise line offering Wedding Packages At Sea!